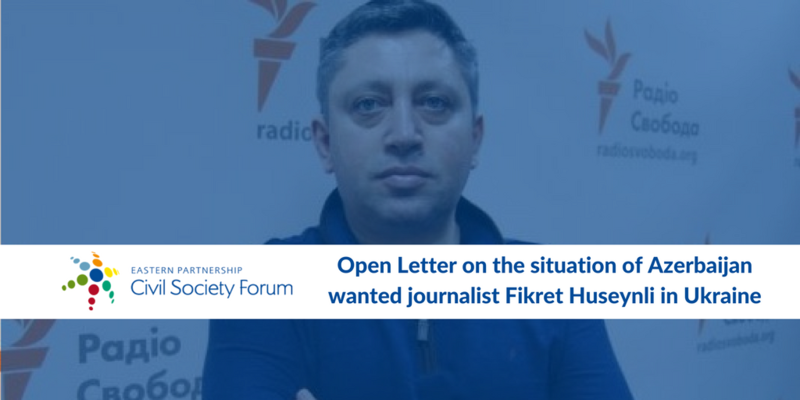 The Steering Committee of the Eastern Partnership Civil Society Forum appeals to Ukrainian authorities and prosecutors, Dutch diplomats and international partners to facilitate the return of Fikret Huseynli, a journalist, to his place of residence in Amsterdam, the Netherlands, and to ensure his safety while he is on the territory of Ukraine. On 2 April 2018, the Pecherski District Court of the city of Kyiv rejected a request for his extradition to Azerbaijan put forward by the Azerbaijani authorities (case No 757/15595/18k). However, the prosecutor’s office has kept his passport, which means that he cannot return to his country of residence. We have reason to believe that he is in danger of being kidnapped while he stays in Ukraine. Were he to be illegally brought to Azerbaijan he would face a long prison sentence. We consider that a decision by the authorities to return his passport would serve Ukraine’s positive image as a law-abiding country. Correction: The EaP CSF Steering Committee mentioned in its statement dated 4 April 2018 that the Pecherskiy District Court of the city of Kyiv on 2 April 2018 rejected a request for the extradition of Firket Huseynli by the Republic of Azerbaijan. This is incorrect. In fact, on 2 April the court ruled that the Prosecutor’s office should not restrain Mr Fikret Huseynli’s freedom of movement while the Prosecutor is reviewing his case. The examination of the extradition order by the Prosecutor’s office is ongoing and the Prosecutor has until October of this year to consider the case. However, the Prosecutor is refusing to return Mr Huseynli’s passport in violation of the court decision directing the Prosecutor not to restrain his freedom of movement.